This exercise is similar to Limbering on /h/. This time, however, all sounds (/m/ and vowels) are voiced. Before beginning this exercise, it is important to explain that there is a ‘right way to hum’ and a ‘wrong way to hum’. The ‘wrong way’ can be described as a hum that is produced too deep in the throat – it appears as if the sound has been swallowed and has a very throaty quality to it . The ‘right way to hum’ can be achieved by asking the client to imagine that he or she is wearing an oxygen mask that covers the nose and mouth. Then, without biting the teeth, hold the lips lightly together and hum a long /m/ as if trying to project it forwards into the imaginary oxygen mask. This should produce a nice, rounded and resonant forward sound: one that is full, and reverberating. Ask clients if they can feel their lips vibrating gently. Also, having each client place their index and second finger gently on their upper lip just below the nose (the philtrum) can sometimes help them to feel the forward vibration. Each part of each exercise (1-8) should be produced on one breath. So, for example, in exercise 1 have clients take in a breath using the abdominal breathing technique, yawning if necessary, and then, on the out breath, produce a relatively long /m:::/ that glides smoothly into the relatively long vowel /u:::/ (oo). For the next part of exercise 1, repeat this same procedure, i.e. clients breathe in using an abdominal technique, yawning if required, and on the out breath produce a relatively long /m:::/ that glides smoothly into the relatively long vowel, /oʊ:::/  (oh)…and so on. 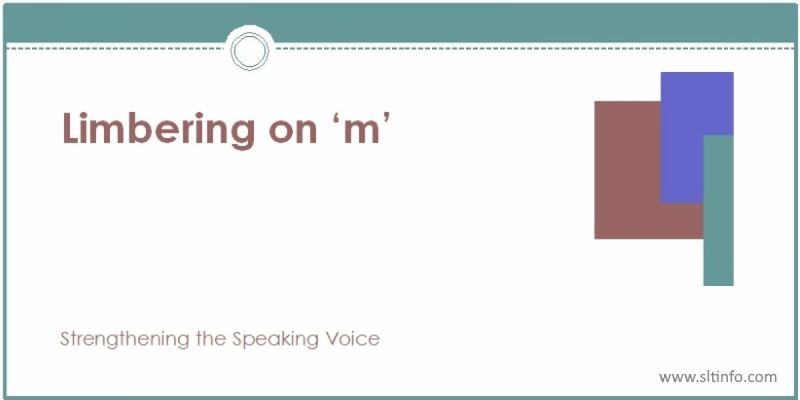 Remind clients of the need to use an easy onset when producing sound combinations that begin with a vowel (exactly as practiced in the previous exercise Limbering on ‘h’). The tasks in exercises 2, 4 and 6 each have sound combinations that begin with a vowel (e.g. oo – m; oo – m – oo; oo – m – m – m). As before, if any client reverts to a hard attack, encourage them to place a relatively short /h/ sound before the initial vowel and try again. The length of the /h/ sound can then be gradually shortened until they are producing the sound combination without any hard attack. Exercises 5, 6, 7 and 8 require clients to produce sequences of /m/ sounds, e.g. As clients gain confidence with these exercises, the sound typically becomes more resonant and volume increases. You can now point this out to them. Help them identify that, without having been asked to increase their volume, this has happened naturally. The reason for this is that they are relaxing appropriately and not creating any undue tensions in the vocal tract. Explain that this is the key to producing a rich, resonant voice. You can also ask clients at this point to place the flat of their hand on the bones of the upper sternum and clavicle to one side of the neck. Now, repeat one of the exercises that includes sequences of /m/ sounds (e.g. exercise 7: m-m-m-moom) and ask them to identify whether they can feel a slight vibration in their hand. Usually most clients will feel some slight vibration, and this can be explained as the upper chest acting as an amplifier of the sound, in much the same way as the body of a guitar or violin serves to amplify sound. This has been achieved, you can explain, because they are now breathing lower down in the chest, they are using a free and easy vibration of the vocal cords and that this, therefore, leaves the spaces of the upper chest free from superfluous tensions that could inhibit amplification of the sound. This explanation, while clearly not fully accurate in anatomical terms, does serve to highlight for clients how appropriate breathing, relaxation and easy onset work together to naturally increase volume. Remember to use a forward, resonant m sound by holding your lips together lightly and, without biting your teeth, imagine you are humming into an oxygen mask that covers your nose and mouth. Say each of the eight lines above five times. If you’re familiar with the Mr Bean character voiced by the comedian Rowan Atkinson (visit http://www.mrbean.co.uk for a sound bite), this represents a good example of the deep-throated sound that is to be avoided. Speakers of Standard Southern British English (SSBE) will likely use the diphthong /əʊ/.